This week's cut-off date loomed for candidates seeking countywide offices. 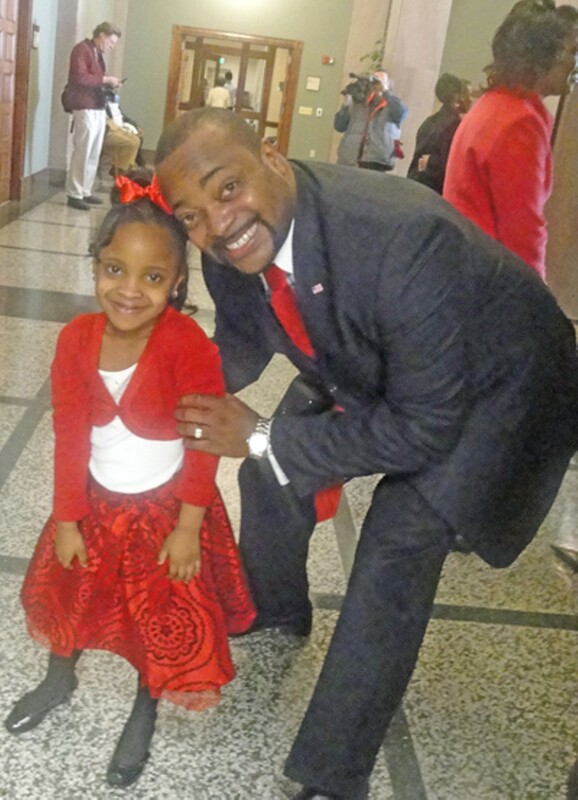 Corey Maclin, candidate for Shelby County clerk, took a major supporter, daughter Carmen, with him to the Election Commission to file. As the filing deadline for countywide offices approached, the blanks were rapidly filling in on ballot slots. Interim Shelby County mayor Joe Ford was not in yet, but he had picked up a petition, and indications were that he would be an official candidate for a full regular term before the deadline of noon on Thursday. That would match him in the May 4th Democratic primary against county commissioner Deidre Malone, who has already filed and who opened up her campaign headquarters on Friday with a bring-'em-on attitude toward both likely primary foe Ford and Sheriff Mark Luttrell, who is almost certain to be the Republican nominee for county mayor. "We'll take whoever decides they want to run ... and we're ready for them," said Malone to supporters' cheers on Saturday. "I'm not afraid of much. ... I'm prepared to be the next mayor of Shelby County. "Some people are born into politics, they're part of a family dynasty," Malone said, clearly indicating Ford, while others have been "in one area of government all their professional lives," a possible reference to Luttrell. She claimed for herself a "well-rounded" dossier that included both government and business experience. Malone and Ford might be interested in the results of the poll, performed by well-known consultant John Bakke, that persuaded a previously reluctant Luttrell to make the race for mayor. According to the sample of some 350 likely voters, the sheriff had a three-to-one edge over Malone and a five-to-three margin over Ford in hypothetical matchups. According to Bakke, Luttrell, whose favorable-to-unfavorable ratio was 17 to 1 — "the highest I've ever seen," said the veteran pollster — was a clear front-runner in every polled group except that of Democratic voters per se. • As the filing deadline got nearer, there were numerous candidates who were still hoping not to have opponents at all. Or to avoid consequential opponents, in any case. One such was Mike Carpenter, the first-term Shelby County commissioner in District 1, Position 3 who has made a name for himself as a maven in several fields — school funding and several aspects of governmental reorganization prominent among them. Carpenter also has crossed swords with members of his own Republican Party. Early in his tenure, when he sided with the commission's Democrats in voting to add a second Juvenile Court judge, it appeared inevitable — even to himself — that he'd have a contested primary in 2010. But, as the week began, Carpenter still had no opponent, and the likely reasons for that were spoken to last Thursday night at a reception/fund-raiser for Carpenter at the Crescent Club. Two of those who made remarks on Carpenter's behalf that night were Luttrell and Memphis mayor A C Wharton, whom Carpenter had served as co-chair of Wharton's post-election transition team. Wharton referred to his support for Carpenter as "a no-brainer," calling the commissioner a "statesman" and describing Carpenter as "someone who is willing to look at each matter that comes before him with one simple question: 'Is this the right thing to do or the wrong thing to do? Not the Republican thing to do or the liberal thing to do, the conservative thing to do, the black thing to do or the county thing to do or the white thing to do, the city or urban, but is this the right thing to do?' I wish we had thousands of Mike Carpenters in office." Like Carpenter, two other high-profile commissioners with penchants for the controversial are equally unopposed — Republican Mike Ritz in District 1, Position 1 and Democrat Steve Mulroy in District 5. Both have proved willing to put themselves on the line — Ritz in any number of causes involving the county's management of its fiscal house and Mulroy in taking the lead on such matters as that of nondiscrimination in government. Both are formidable in debate, though Ritz's modus operandi runs to the damn-the-torpedoes variety, while Mulroy, equally staunch, is more willing to accept compromise at the margins of an issue. Understandably, the well-financed Mulroy is keen for the depth of his endorsements — which include several from organized labor and such Democratic potentates as Wharton, interim mayor Ford, former congressman Harold Ford Sr., and City Council chairman Harold Collins — to be known. Essentially, Ritz, acting as an individual and not on behalf of county government (but addressing his complaint under his official commission letterhead), charges that the Med has been unjustly deprived of its rightful share of federal funding — largely as a result of state government's routing into the at-large TennCare network the larger part of federal funds earned by the Med for providing uncompensated care to indigents. Says Ritz in the letter of complaint (which is accompanied by a variety of supplementary graphs, tables, and other exhibits): "Tennessee recently received an annual payment from DHHS of over $200 million for uncompensated care. Of that amount DHHS sent to Tennessee $81 million, based on the uncompensated care at the Med alone. However, Tennessee has forwarded to the Med total supplemental care payments of $29 million to $39 million a year." And Ritz continues: "Therein lies my Complaint against the state of Tennessee." It remains to be seen how the federal government itself deals with Ritz's complaint. The reaction from state government can only be described as stony, even hostile. The state finance commissioner dispatched an e-mail to Med administrator Gene Holcomb that seemed to threaten a hands-off attitude toward the Med's problems and stating, "It [Ritz's complaint] has changed our ability to negotiate any further agreement for the benefit of the Med. I sincerely hope that other sources become available to assist you." Ritz himself has indicated he will continue to press the matter, come what may. • Meanwhile, one of Ritz's colleagues, Commissioner George Flinn, has launched his own Med-related initiative with the federal government. He had already prevailed on commission members to endorse his call for a commission letter to this year's crop of gubernatorial candidates demanding that they pledge to support a routing of all uncompensated care funds generated by the Med to operations of the Med itself. Flinn, now a Republican congressional candidate in the 8th District, upped the ante at last week's public meeting of the commission by announcing his own unilateral mission. He said he had arranged a visit to the "White House" to meet with unspecified staff members there in an effort to solve the imbroglio over distribution of uncompensated care funds. And on Monday Flinn's gubernatorial pledge, not yet even formally released, got its first taker — Republican gubernatorial candidate Zach Wamp. In town to formally begin his statewide "announcement" tour, Wamp answered "absolutely" when asked if he would sign the pledge. Flinn's vacated seat is up for grabs and so far is being sought by Flinn's longtime assistant Heidi Shafer and former commissioner John Willingham. • John Pellicciotti, who since mid-January has been the interim Shelby County commissioner in District 4, Position 3, will seek election this year as a full-time commissioner from District 4, Position 1, the seat being vacated for term-limits reasons by current commission chair Joyce Avery. Pellicciotti expects a hard-fought race between himself and Probate Court clerk Chris Thomas, who also seeks the Position 1 seat. Pellicciotti offered no criticism of Thomas but suggested, without elaborating, that there were possible philosophical differences between the two. On the commission, Pellicciotti has kept a generally low profile but has not been reticent about offering solutions to issues before the legislative body. He authored the text of a compromise resolution allowing county employees to volunteer for Haiti relief missions, which was narrowly defeated. And as this week began, Pellicciotti — who evidently has caught a case of innovation-itis from his senior colleagues — had drawn up a resolution for budget-cutting and tax relief which he planned to present in committee on Wednesday. Pellicciotti's plan calls for "$20 million in personnel/payroll deductions, excluding the Sheriff's office and the county Fire Department" and would allocate "no less than 60 percent of cost savings incurred to a property tax decrease, and no less than twenty percent of cost savings incurred to debt reduction."